« With iPad out of the way, AppleTV to get some love? 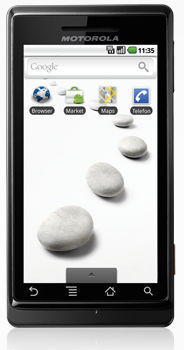 The Milestone is the largest touch screen phone I’ve tried to use for any length of time. Its 3.7 inch capacitive screen is a joy to use for web surfing and media playback but, in the end, is a tad too large for my liking. This is made worse by the positioning of the touch-sensitive hardware buttons which reside at the bottom of the phone just above its protruding ‘chin’. The problem is that there doesn’t seem to be a very comfortable or practical way to hold the device – especially for one handed operation – without accidentally triggering an unwanted action. I also found it difficult to get used to Android’s standard back button being to the far left rather than right of the device. 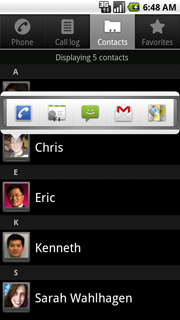 This might arguably be a more logical position but it isn’t the norm on other Android phones, such as those from HTC. On the plus-side, the Milestone is incredibly well built, with a generous use of metal, and relatively sleek despite housing a pretty large slide-out landscape keyboard, which also performs pretty well even though the keys are very flat. Typing on the Milestone is on-par or better than many devices with a similar form-factor. Sensibly there’s a 3.5mm headphone jack and charging is done via microUSB. There’s also a microSD card slot for storage as the Milestone doesn’t come with much built-in. There’s a 5 megapixel camera too and it’s pretty decent, especially for video recording as long as there’s decent lighting. Overall, the Milestone’s industrial design seems, not dissimilar to the Dext (see review), aimed at a North American market – it’s proved most popular amongst my US friends – and this could also explain why its not gone mainstream here in the UK. I’d recommend anybody considering purchasing the Milestone to get a hands-on in person, even a dummy model, before pulling the trigger. Who would have thought a phone could be so culturally divisive? 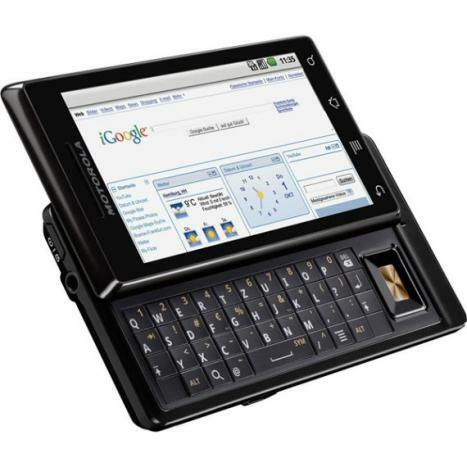 The Motorola Milestone runs Android version 2.0 out of the box, though an upgrade to 2.1 (and presumably 2.2) is said to be forthcoming. Interestingly, Motorola decided not to put its own social networking-savvy UI enhancement (MotoBlur) on the Milestone, sticking with the stock offering. That’s probably because the device has a slightly different target audience and also, possibly, because 2.0 brings with it greater social networking integration. Third-party apps such as Facebook can now tie into the phone’s address book so that any contacts are merged into a unified contacts list. Also new to Android 2.0 is built-in support for Microsoft Exchange, multiple email/contact account support (not just a single Gmail address, for example) and the Quick Contact panel in Android’s address book. This enables “a user can tap a contact photo and select to call, SMS, or email the person.” The same controls are also accessible via other applications such as Email, Messaging, and Calendar. As already noted, media playback is a joy on the Milestone, thanks to its large and bright screen. A favorite app of mine is the Engadget app, which provides access to the Engadget Show videos, along with news, audio podcasts etc. Unfortunately, there’s still no official BBC iPlayer for Android, which makes it lacking compared to the iPhone and many of Nokia’s Symbian phones. Instead, you’ll need to download the far from perfect and unofficial beebPlayer. Music playback performs well, benefiting from that 3.5mm headphone jack. And overall, the Android Market is filling up and improving in quality and the fact that the Milestone runs (almost) the latest build of the OS means that you have the pick of the bunch. Another benefit of Android 2.0 is support for Google free Sat-Nav solution via Google Maps. This offers full turn-by-turn voice directions, including the rather nifty street view where it’s available. Interestingly, Motorola seems to be shipping its own Sat-Nav app too (or at least on this review loan). Of course, like any Android phone, support for Google services such as Gmail, Contacts, Calender and YouTube is superb – over-the-air syncing included – and if you’re a Gmail junkie then Android and the Milestone should see you good. As you’d expect from an Android phone, web browsing is speedy and robust. There’s support for pinch-to-zoom too, although rather annoyingly text doesn’t seem to automatically re-size and re-flow when in portrait mode to avoid horizontal scrolling. The Motorola’s form-factor divides opinion – I’m not its greatest fan – but with a generous 3.7inch screen, large slide-out QWERTY and solid build it will certainly find plenty of fans. Software-wise, you have almost the latest build of Android, which has now matured into a very capable smartphone OS. Updates should arrive speedier too since the Milestone is stock Android, enabling support for the latest third-party apps. Overall, the Milestone isn’t my favorite Android phone (I actually prefer the Motorola Dext and, of course, HTC’s Hero/Legend) but it’s certainly a contender.